Lexmark printers are efficient printers that can perform high-end printing. As long as you maintain the printer in good condition, the printer functions well. The printer needs to be cleaned on a regular basis as dust may build upon its surface and interior parts. 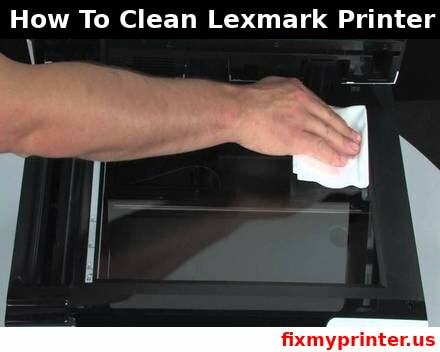 Follow the below mentioned instruction for how to clean Lexmark printer quickly. Tap the button on the left-hand side of the printer and lower the cover to open the front door. Remove the cartridge assembly from the printer by pulling the cartridge handle and place it on a flat surface. Look for the glass printhead lens at the top of the printer. Wipe the lens with a lint-free cloth. Install the cartridge assembly back in the printer. Turn on the printer and print a test page. Step 1: For how to clean Lexmark printer, first Switch off the printer. Step 2: Open the front cover by tapping the button on the left side of the Lexmark printer and lowering the cover. Step 3: Take the print cartridge assembly from the printer by pulling the toner cartridge handle. Keep the print cartridge assembly on a clean, flat surface. Step 4: Do not tap the button on the print cartridge assembly while removing it. Step 5: Do not leave the cartridge assembly exposed to light. Step 6: Search for the glass printhead lens located within the recessed area at the top of the printer. Step 7: Now, gently wipe the printhead lens with a clean, dry, lint-free cloth. The cloth that is not dry and clean may damage the printhead lens. Step 8: Reinsert the printer cartridge assembly in the printer. You can do this by aligning the green arrows on the guides of the print cartridge assembly with the green arrows on the tracks of the Lexmark printer. ->Now, push the print cartridge assembly into the printer until it clicks to a place. Step 9: Close the front cover and then turn the printer on. Print a document to check the print quality. You can also get the technical solution from us for how to clean Lexmark printer.